US President Donald Trump has sensationally quit his planned nuclear summit with North Korean leader Kim Jong-un. The president was set to meet Kim next month in Singapore in what was billed as an historic canvassing of nuclear disarmament on the Korean peninsula. But following an insulting statement from North Korea's foreign affairs minister this morning, in which he labelled US Vice President Mike Pence a "political dummy" and threatened to cancel the summit, Mr Trump released an open letter withdrawing from the talks. He cited the rogue regime's "tremendous anger and open hostility" among the reasons for pulling out. Mr Trump - who has referred to Kim as "Little Rocket Man" and boasted about the size of his nuclear button - appeared to reignite his bellicose rhetoric. "I was very much looking forward to being there with you," Mr Trump said. "Sadly, based on the tremendous anger and open hostility displayed in your most recent statement, I feel it is inappropriate, at this time, to have this long-planned meeting. 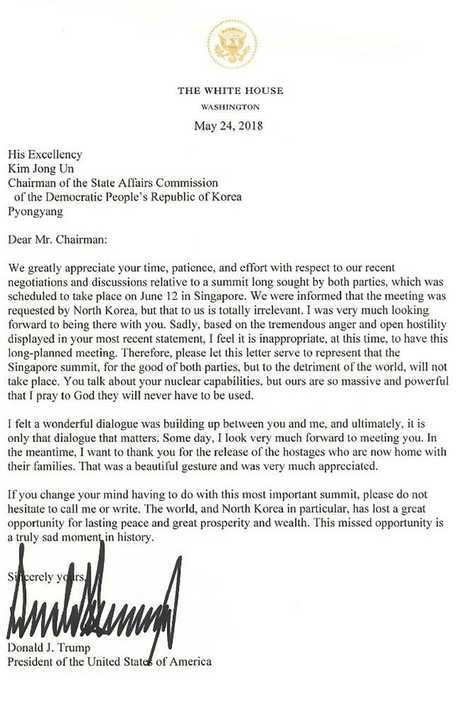 "Therefore, please let this letter serve to represent that the Singapore summit, for the good of both parties, but to the detriment of the world, will not take place. A copy of the letter US President Donald Trump addressed earlier to North Korean leader Kim Jong Un announcing that the planned summit between them in Singapore on June 12 “will not take place”. Trump and Kim had been scheduled to meet in Singapore on June 12 in what would have been the first face-to-face meeting between a US and North Korean leader. The breakdown came shortly after a North Korean official said Pyongyang was prepared for a nuclear showdown if talks with the US failed. 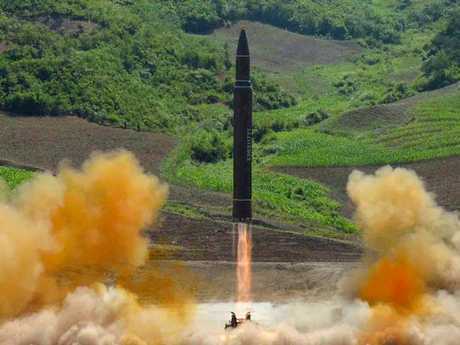 "Whether the US will meet us at a meeting room or encounter us at nuclear-to-nuclear showdown is entirely dependent upon the decision and behaviour of the United States," said Choe Son Hui, a vice minister in the North Korean Foreign Ministry, CNN reported. Choe was responding to comments Pence made Monday during a Fox News interview that she deemed "unbridled and impudent." She took particular issue with Pence's statements about US National Security Adviser John Bolton, who said the US would look to the negotiations with Libya in the early 2000s when dealing with North Korea. "There was some talk about the Libya model," Pence told Fox News. "As the president made clear, this will only end like the Libya model ended if Kim Jong Un doesn't make a deal." Choe called Pence a "political dummy" for comparing Libya to North Korea. Team Trump was enraged by the statement and wanted to respond forcefully, several people familiar with the situation told CNN. "Some day, I look very much forward to meeting you. In the meantime, I want to thank you for the release of the hostages who are now home with their families," Mr Trump said. 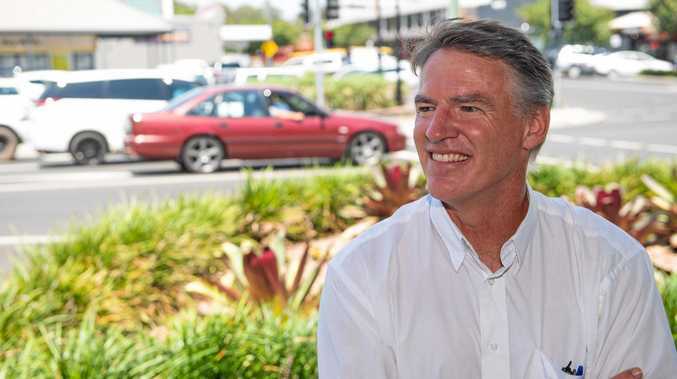 "That was a wonderful gesture and was very much appreciated." Trump said the North Korean leader should not "hesitate to call me or write" if he changes his mind about their now-cancelled summit. "The world, and North Korea in particular, has lost a great opportunity for lasting peace and great prosperity and wealth," he said. "This missed opportunity is a truly sad moment in history." In an interview that aired earlier Thursday on "Fox & Friends," Trump said the US might agree to allow North Korea to denuclearise in phases in exchange for relief from sanctions. "We are going to see. I would like to have it done immediately. But … physically, a phase-in may be a little bit necessary," he said. "It would have to be a rapid phase-in." The president cancelled the summit just hours after Pyongyang said it had "completely" dismantled its Punggye-ri nuclear test site in a move portrayed by the hermit kingdom as a goodwill gesture. Reporters at the scene described a series of explosions throughout the day, three of them in entry tunnels to the underground facility, followed by blasts that demolished a nearby barracks and other structures. "There was a huge explosion, you could feel it. Dust came at you, the heat came at you. It was extremely loud," Tom Cheshire, a journalist for Sky News who was among those invited to attend the ceremony, wrote on the British broadcaster's website. 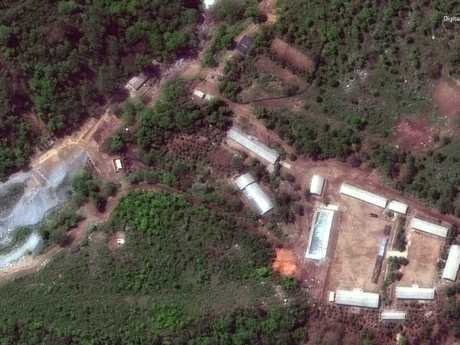 In a statement, North Korea's nuclear weapons agency said the site had been dismantled "completely ... to ensure transparency of the discontinuance of nuclear test(ing)." South Korea welcomed the move. "(We) expect it to serve as a chance for complete denuclearisation going forward," Noh Kyu-duk, spokesman for the Ministry of Foreign Affairs, told reporters. In recent days, Trump sounded less optimistic that the summit would take place on June 12 after Kim declared last week that unilateral denuclearisation was off the table. "We'll see what happens. Right now we're looking at it, we're talking about it," he said on "Fox & Friends." "And they're talking to us. We have certain conditions. We'll see what happens. But there's a good chance." About fours hours later after his interview aired, he cancelled the meeting.